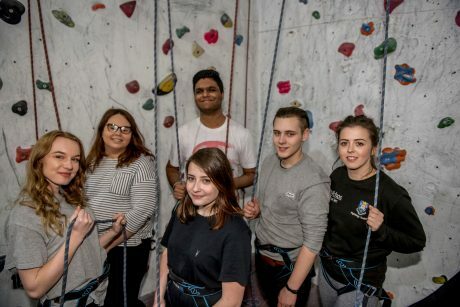 Rotherham teenagers are set to scale new heights in a challenging physical activity programme launched this week to inspire them to aim high in their education. Forty-eight students from Thomas Rotherham College are taking part in Challenge Yourself, which develops self-confidence, teamwork and problem solving skills. The scheme, for 16 and 17-year-olds, includes abseiling, climbing, orienteering and weaselling in three activity sessions from April until June. HeppSY+ is running a long-term campaign to double the number of young people going on to degree level courses and apprenticeships at further education colleges and universities in 45 target electoral wards in Barnsley, Doncaster, Rotherham, Sheffield, North East Derbyshire and North Nottinghamshire. The HeppSY+ graduate intern outreach team attend the Challenge Yourself activity sessions and provide information about higher education courses at college and university. The team comprises former graduates from a broad range of backgrounds who talk about their own experience of university as well as other issues such as how to apply and finance. The Challenge Yourself programme takes place at the Foundry Climbing Centre in Sheffield in April and Burbage and Stanage Edge, and Thornbridge Hall, in the Peak District in June. For more information, visit www.heppsy.org. Follow @HeppSYplus.